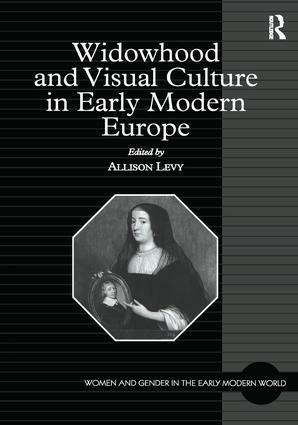 Whereas recent studies of early modern widowhood by social, economic and cultural historians have called attention to the often ambiguous, yet also often empowering, experience and position of widows within society, Widowhood and Visual Culture in Early Modern Europe is the first book to consider the distinct and important relationship between ritual and representation. The fifteen new interdisciplinary essays assembled here read widowhood as a catalyst for the production of a significant body of visual material-representations of, for and by widows, whether through traditional media, such as painting, sculpture and architecture, or through the so-called 'minor arts,' including popular print culture, medals, religious and secular furnishings and ornament, costume and gift objects, in early modern Austria, England, France, Germany, Italy and Spain. Arranged thematically, this unique collection allows the reader to recognize and appreciate the complexity and contradiction, iconicity and mutability, and timelessness and timeliness of widowhood and representation. Prize: Winner of the Society for the Study of Early Modern Women Award for a collaborative project published in 2003. Contents: Widow's peek: Looking at ritual and representation, Allison Levy; Representing widowhood: mourning models: 'Widowhood was the time of her greatest perfection': Ideals of widowhood and sanctity in Florentine art, Catherine Lawless; Memento Mori: Death, widowhood and remembering in early modern England, J. S. W. Helt; Mourning widows: Portraits of widows and widowhood in funeral sermons from Brunswick-Wolfenbuettel, Marina Arnold; Re-presenting widowhood: fashionable choices: Casting her widowhood: Contemporary and posthumous portraits of Caterina Sforza, Joyce de Vries; A widow's tears, a Queen's ambition: The variable history of Marie de Médicis's bereavement; Elizabeth McCartney; Conceptualizing the Kaiserinwitwe: Empress Maria Theresia and her portraits, Michael E. Yonan; Widowhood and representation: building memories: Individual fame and family honor: The tomb of Dogaressa Agnese da Mosto Venier, Holly S. Hurlburt; Margaret of Austria and the encoding of power in patronage: The Funerary Foundation at Brou, Laura D. Gelfand; A widow building in Elizabethan England: Bess of Hardwick at Hardwick Hall, Sara French; Constructing convents in 16th-century Castile: Toledan widows and patterns of patronage, Stephanie Fink De Backer; Widowhood and re-presentation: constructing histories: Trecento Rome: The poetics and politics of widowhood, Cristelle L. Baskins; Framing widows: Mourning, gender and portraiture in early modern Florence, Allison Levy; Contested narratives: Elisabeth of Austria and a relic of St Leopold, Amelia Carr; Afterword: Last rites: mourning identities (? ), Allison Levy; Index. The study of women and gender offers some of the most vital and innovative challenges to current scholarship on the early modern period. For more than a decade now, Women and Gender in the Early Modern World has served as a forum for presenting fresh ideas and original approaches to the field. Interdisciplinary and multidisciplinary in scope, this Routledge series strives to reach beyond geographical limitations to explore the experiences of early modern women and the nature of gender in Europe, the Americas, Asia and Africa. We welcome proposals for both single-author volumes and edited collections which expand and develop this continually evolving field of study.